The Boss Sauce: Chardonnay-Dijon Pan Sauce Over Petit Filet and Shrimp with Grilled Asparagus and Herbed Rice – Pao Says, "Open Wide!" Ryan just received word that he did very well on his medical boards, so we were in need of a celebration dinner! I’m not going to lie… I kind of surprised myself with how delicious this was. It’s a quick and simple, yet elegant dinner- give it a shot! Season your filet with a sprinkle of salt, garlic powder, and pepper on all sides. Make sure the filet is at room temp to ensure even cooking. Drizzle a bit of olive oil in a steel pan and heat it up to Med-Hi. Cook the filet in the pan (mine took about 3 minutes to a side for med-rear, but it depends on the size of your filet). Once it’s sufficiently browned on all sides, take it off the heat and cover it with foil- it’ll keep cooking over these next few minutes and all the juices will settle. In the same pan, add the butter, about a tbsp olive oil, the garlic, onions, and scallions . Once the butter is melted, add the shrimp and allow them to cook almost all the way through … This takes just a few minutes. Once both sides are golden, add in the Chardonnay and Dijon mustard and stir everything to combine. Once you get the pan sauce to come together, let it reduce for a few minutes (2-3) and then you’re ready to serve! 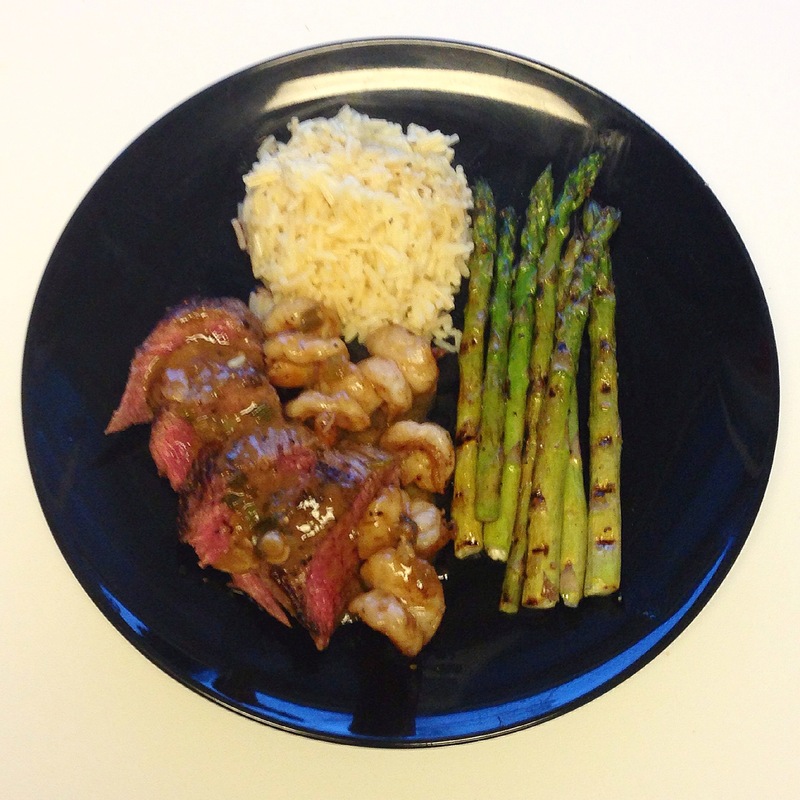 Cut your filet against the grain (to get optimum tenderness), and top with your shrimp and pan sauce!